Comfrey is an herb with a long reputation for healing wounds and mending broken bones. For centuries, comfrey was considered a safe medicine, and in some cases even a food. But today, regulators around the world strongly warn against taking it internally. Comfrey has long, dark green leaves with a rough, stubble-like texture, and hanging clusters of small, bell-shaped flowers. Since at least 50 AD, doctors who have seen comfrey in action describe what sounds like a wound healing miracle. Whether its skin, cartilage, tendons, or even bone, comfrey appears to weld tissue together, and often erases any trace of a scar. Throughout history, comfrey has been used to heal wounds in battle, and was used extensively in World War I to treat maggot-infested wounds. Early American herbalist Samuel Thomson claimed to have used comfrey to heal his foot from a farm equipment accident when he was only 9. 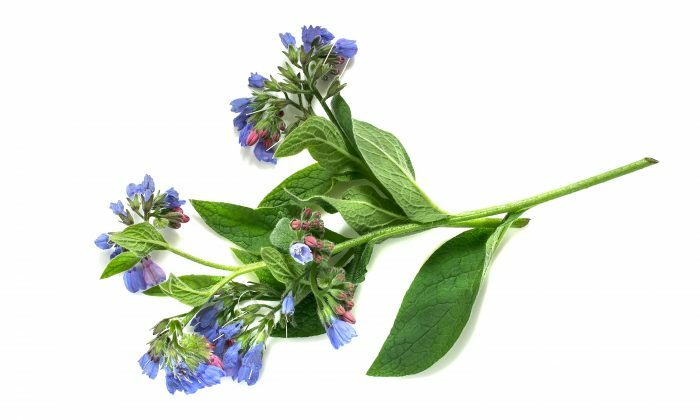 One of comfrey’s many folk names, boneknit, says it all, and modern studies have demonstrated that comfrey is a medicine with genuine merit. Randomized controlled trials have shown that topical use is effective at treating injury, arthritis, and inflammation. You can see how comfrey makes our cells grow by watching the plant grow. Comfrey is very prolific. You can chop it down to the root and a few weeks later it will completely regenerate. As a result, you can harvest from the same plant several times a year. In the 1980s, comfrey’s benevolent reputation took a drastic turn for the worse when researchers discovered compounds in the plant called pyrrolizidine alkaloids (PAs), which damaged rat livers. Consumers panicked, and supplement makers pulled the herb from their formulas. By the turn of the new millennium, regulators in the United States, Canada, Europe, and elsewhere banned all comfrey products marketed for internal use. However, considering the evidence used to justify the comfrey scare, it seems like an overreaction. While comfrey does contain trace amounts of PAs, studies showing problems did not involve realistic doses of the whole herb. Instead, trials focused on rats injected with isolated alkaloids or fed enormous amounts of comfrey extract. In one often-referenced study, baby rats were given the equivalent of many times their weight of comfrey leaf before they demonstrated liver damage. These studies led to current conventional wisdom, which dictates that comfrey be restricted to external use only. Even external use is suspect in some circles as PAs can also be absorbed through the skin. Commission E (Germany’s FDA for herbal medicine) only endorses topical comfrey for blunt injuries. Use on open wounds is discouraged. But some researchers insist that comfrey only presents a danger with prolonged use at high doses. They argue that the plant is being subjected to a standard that most pharmaceuticals would fail. One study published in the journal Science by Dr. Bruce Ames found that comfrey leaf tea was less carcinogenic than beer. In 2001, just after the U.S. Food and Drug Administration instituted its ban on comfrey, Dr. James Duke, former chief of the U.S. Department of Agriculture’s medicinal plants research laboratory, told the Washington Post that the herb was “very unlikely” to cause internal problems at a realistic dose. “It does contain traces of pyrrolizidine alkaloids, and anyone eating it like spinach three times a day for 10 years might have a problem, but nobody in their right mind is going to do that,” Duke said. While comfrey pills are no longer available, the plant itself is not a controlled substance. It grows freely as an ornamental in gardens across the country, and herbal suppliers still sell the dried leaf and root in bulk, albeit with stern warnings about liver damage. 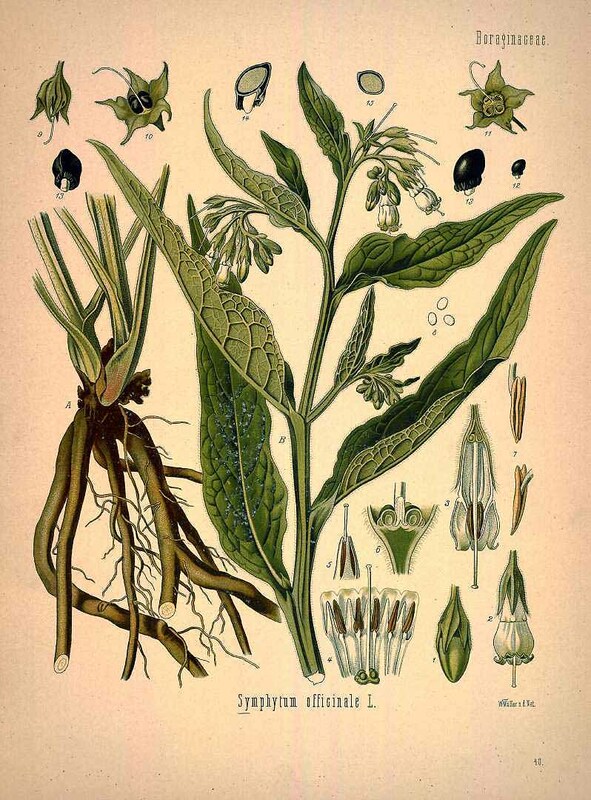 Over the past 2000 years (before the worries of PAs) comfrey was used internally to treat a number of health problems, particularly ulcers, chronic bronchitis, and other issues where mucous membranes are damaged or severely inflamed. The root contains much more PAs than the leaf, and the larger, mature leaves contain less PAs than the smaller, younger leaves. 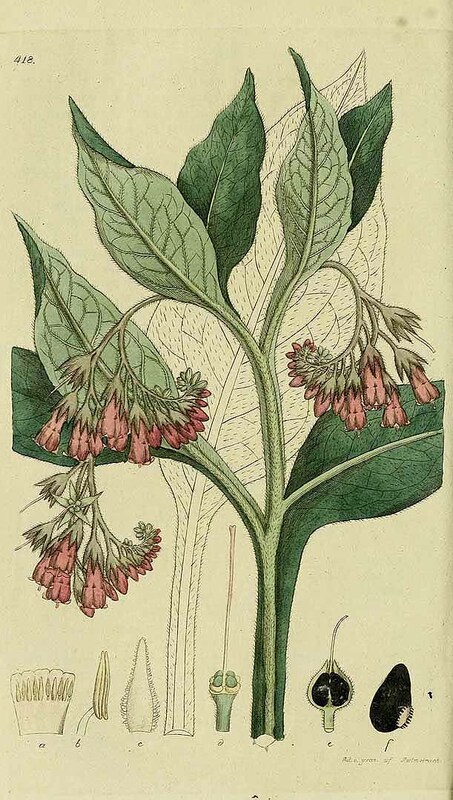 Some species of comfrey, like Russian comfrey (Symphytum x uplandicum), contain higher concentrations of PAs. The kind used in herbal medicine, wild comfrey (Symphytum officinale), has much less. Some European companies have recently created topical comfrey products with no PAs, but none are marketed for internal use. Many herbalists now combine comfrey with milk thistle—an herb synonymous with protecting the liver from toxins. There are four known human cases of liver damage where comfrey is suspected. One involves a woman who developed liver problems after taking very high doses of comfrey every day for nine years. In the other examples, there are either too few details, or too many other potentially incriminating factors (pharmaceutical drugs, for example) to make it clear that comfrey was the culprit. The most vulnerable to comfrey’s liver damaging potential are children, women who are pregnant or nursing, and people with preexisting liver problems. However, in the past, the nutrient-rich comfrey root was often given to children. According to herbalist Peter Holmes, the Swiss used to bake the sweet taproot into cakes, and the Japanese would eat comfrey root tempura. In the Middle Ages, comfrey root was used to flavor beer. Don’t mix comfrey with drugs that are hard on the liver. The potential damage of PAs is made worse in the presence of acetaminophen (Tylenol), a drug with an irrefutable reputation for liver damage. Finally, be smart about it. Don’t take ridiculously high doses for long periods of time (more than four months). There is no need to. Comfrey works fast, and typically helps speed up recovery time.